Last Updated: July 21, 2015 | Subscribe to our weekly newsletter! The choice between powder and liquid chlorine is always a concern for pool owners and many aren’t sure which one they should use to make sure their pool is properly taken care of year after year. You can often receiving conflicting information about these products depending on who you ask. The truth is, there are benefits and drawbacks to using both powder and liquid chlorine. The most important thing to remember is you need to choose the best product based on your budget and equipment. 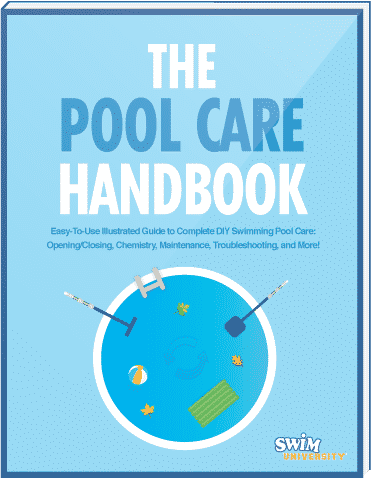 Chlorine is the main chemical that pool owners use as a sanitizer or disinfectant. Chlorine is widely used by pool owners to destroy bacteria and algae to be sure their pools remain clean, clear and safe for swimming. Chlorine is produced by the electrolysis of saltwater and is very good at breaking the cell walls of microorganisms such as bacteria and algae and then oxidizing them. Chlorine is unstable, however, and will continue to break down until it is no longer effective. That is why you must keep adding chlorine to your pool on a regular basis. Chlorine is also considered a hazardous material so it should always be handled with care and pool owners should take proper safety precautions before handling it such as wearing gloves and goggles when using it. Liquid chlorine is made by bubbling the gas form of chlorine through caustic soda. It has a high pH level of around 13 and can simply be poured directly into the pool. 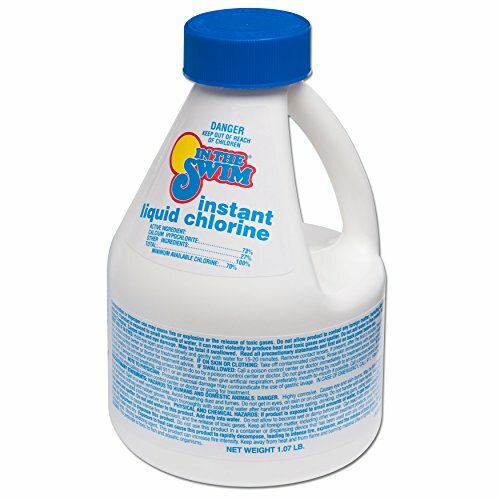 Liquid chlorine If you click this link and make a purchase, we earn a commission at no additional cost to you. is used mainly in large commercial or high traffic pools because it can added in bulk with some large commercial pool owners adding it from 55 gallon drums. For smaller, residential pools, its cost may outweigh its efficiency. Liquid chlorine, though often cheaper than other forms, needs much more acid to be added to the water to counteract the high pH and it is highly corrosive which could lead to damage of your pool walls or bottom if great care isn’t taken when using it. The most common form of chlorine used by private pool owners, it is often a little more expensive than liquid chlorine, but is much easier to use and has a lower pH, meaning you won’t spend as much on acid to maintain proper pool balance. Dichlor If you click this link and make a purchase, we earn a commission at no additional cost to you. – This powder has a low pH or about 7 so you won’t have to use as much acid to balance your water and it dissolves rapidly and begins to work on contaminants immediately. It only contains about 62% actual chlorine per pound. This product is stable and can be used as a shock treatment but is more expensive than other options. Lithium Hypochlorite If you click this link and make a purchase, we earn a commission at no additional cost to you. – Lithium has only about 35% chlorine per pound and its pH is rather high at 11 meaning you will need more acid to balance your water compared to using dichlor. It’s main advantage is it dissolves very fast reducing the chancing of a bleaching effect occurring on vinyl pools. 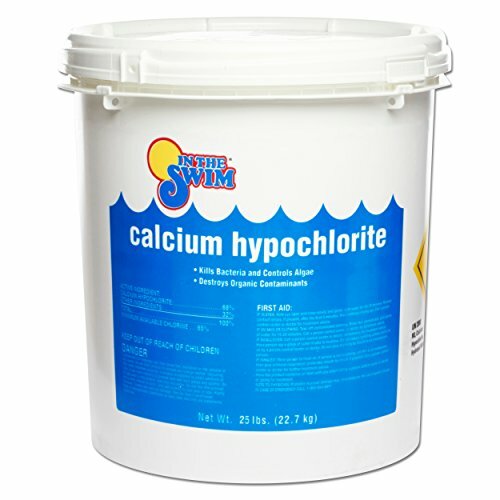 Calcium Hypochlorite If you click this link and make a purchase, we earn a commission at no additional cost to you. – Calcium is one of the most popular chlorine treatments as it is one of the most cost effective. It contains about 65% chlorine with a pH of 12. This will require more acid to properly balance your water. It is cheap but not as safe as Lithium as it is unstable and breathing the fumes can be dangerous. Your decision will largely be based on how it will be used and your available budget. Liquid chlorine would be the best choice for owners of very large or public pools, but the costs associated with it and the available chlorine per pound make could mean that powder chlorine is the better option for a home owner’s backyard pool. In the end, both products will do their job and keep your pool clean and clear. Just be mindful of your budget needs and the needs of your equipment before choosing liquid or powder chlorine for your pool. Powder and liquid chlorine both have their strengths and weaknesses. Before you choose which one you will use, examine the operating manuals of your equipment to see which type is needed and then look at your budget to decide which one you can afford. Once you make your decision, be sure you handle the chlorine carefully and follow the instruction for adding it to your pool in detail so you can be sure your pool and its equipment doesn’t get damaged in the process.